Over this weekends Preview for WAR (and Open Beta) I decided to roll a Warrior Priest. Bald, armored and a big hammer. How can you go wrong? I only have played up to rank 6 so far, so anything I say only applies up to that point. The WP's mechanic is Righteous Fury. It is like mana, in that it regenerates and tries to stay full. When certain skills are used, it drains the Righteous Fury. Other skills have a side effect of filling it up. The WP is a melee healer. This is a new class for me as I never really played anything like it before. With a normal healer, you generally just hand back and play whack-a-mole with healing bars. Not really so with the WP. You must get in there in fight in order to keep your Righteous Fury filled. I actually found this class to be pretty difficult to play as a healer. When playing solo, or just healing myself, it was great fun. taking a beating and being able to heal yourself is quite nice. However, trying to fight and heal myself and others became pretty difficult. This could just be because of my lack of keyboarding skills or some other deficiency. It seems like the WP healing is only really meant to be targeted at a single target throughout the fight. The WP does have access to AoE healing, like Prayer of Devotion and Divine Strike. Overall it was a fun and interesting class. I will likely roll a WP alt, as being able to fight and heal is fun. Melee healers really aren't ... standard healers as we're used to them. WP/DoK get much weaker healing, but they get medium armour (at least DoK do, I'm assuming WP do also) and they do a great deal more damage than plain-healers, even if it's not mDPS amounts. In PvE, melee healers are pretty much godlike, because it seems you can heal faster than most stuff can hurt you and though it takes forever to kill something, it's pretty painless. I've soloed equal-level champion-type mobs (and their 2 normal friends) with my DoK and I've heard about hero-type solos (but who knows). In RvR, it's unfair for *all* your side buddies to expect massive amounts of healing from a melee healer because you a) just don't have the heal power and b) have to keep hitting stuff or your heal-power gets drained. The healpool regenerates out of combat, but in combat the only thing that works is hitting stuff, or using an ability like AP-->BP like the DoK have. It's an interesting archetype to play though. They can seem godlike in RvR too, but I've killed my share of both DoKs (even as a weedy no-DPS archmage) and WPs, and I'm total RvR noobsauce so if I can do it, anyone can. ;) Even after recent renown gear tweaks to remove the sudden R10/RR6 godmode gear, rank + renown gear + skill is still the primary defining factor in RvR (after sheer numbers). That's probably as it should be. Great article title and picture. 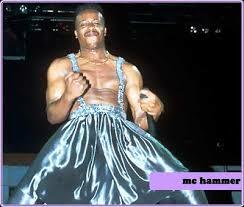 You sir, are full of win for the Mc Hammer reference! @ysh: I only really had a chance to pvp in some scenarios... where I was focus fired. Survivability when being hit on by 5 Orcs is not high... which is as it should be.